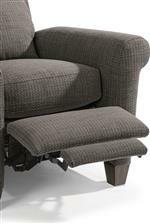 Enjoy classic style, convenience and functionality all in one with this power high-leg recliner with power headrests. The rounded arms detailed with welt cording and recessed back wings instill a traditional vibe on this otherwise simplistic frame. The smooth reclining mechanism allows you to change angles effortlessly while you adjust the power headrest independently for a completely customized position. For convenience, a USB port is installed at the center of the power control for all of your technology devices. This recliner requires 17" wall clearance. 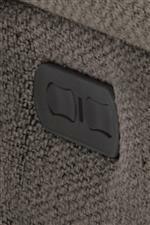 An optional home button returns the headrest and footrest to their original positions, see retailer for details. The Abby Casual Power High-Leg Recliner with Power Headrests and USB Ports by Flexsteel at Jordan's Home Furnishings in the New Minas, Halifax, and Canning, Nova Scotia area. Product availability may vary. Contact us for the most current availability on this product. 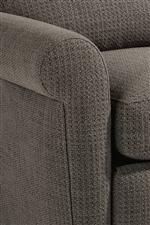 Fabric Options Available in over 1000 upholstery options including incredibly durable Sunbrella™ and Revolution™ fabrics through special order methods. Wood & Finish Florentine wood finish comes standard. 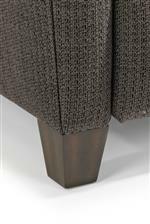 Also available in Dusk, Old Vine, Urban Renewal and Valencia finishes through special order methods. Padding & Ergonomics Reversible high-density cushion with 2 lb high-resiliency, high-density polyurethane foam core topped with recover foam and bonded polyester fibers comes standard. Upgrade to high resilient firm cushion available through special order methods. Casual with classic style elements without sacrificing functionality and convenience, this power high-leg recliner will become an asset to your home. Traditional details such as rolled arms tailored with welt cording and recessed back wings are complemented by casual plush cushions and simple tapered block feet for a balanced look that will blend nicely with your existing decor. Both pieces feature a smooth reclining mechanism allowing you to change angles effortlessly while power headrests and a USB charging station are also featured on the upgraded model. The Abby collection is a great option if you are looking for Casual furniture in the New Minas, Halifax, and Canning, Nova Scotia area.